"Dark And Difficult Times Lie Ahead." Harry Potter begins dreaming about a man named frank who is killed after overhearing Lord Voldemort making plans with Peter Petigrew an old friend of his father's. In order to take his mind of it he enjoys a trip with his friends to the Quidditch World Cup. However he does not enjoy it the entire time. Followers of Lord Voldemort known as death eaters terrorize the camps after the game and leave the death mark in the sky as a sign that Lord Voldemort is rising to power once again. When they return to Hogwarts school of Witchcraft and Wizardry the students all learn there is a new Defense Against the Dark Arts teacher named Mad-Eye Moody. In their first class they learn of the unforgivable curse one of which Nevel's parents had succumbed to and one which killed Harry's own parents. Later the headmaster announces they will be hosting the Triwizard Tournament where one student from each school competes in three separate competitions. However due to the dangers the contestant must be 18 years old. Somehow Harry's name is entered and he is only 14 years old so by the rules he and another student who had also been chose by the Goblet of Fire must compete in the Triwizard Tournament. The Triwizard Tournament consists of 3 contests. The first is to receive an egg that is being guarded by a Dragon. The next is to save someone special to the competitor from drowning in the lake. The last is to find the tricup in a large maze of hedges. The other Hogwarts competitor is killed and Harry encounters Lord Voldemort who tries to kill him but Harry is protected by the ghosts of his parents. When Harry escapes and returns to Hogwarts with the body of his friend and also the other Hogwarts competitor he informs the crowd that Voldemort is back. Harry is very upset about the death and what he had just encountered. 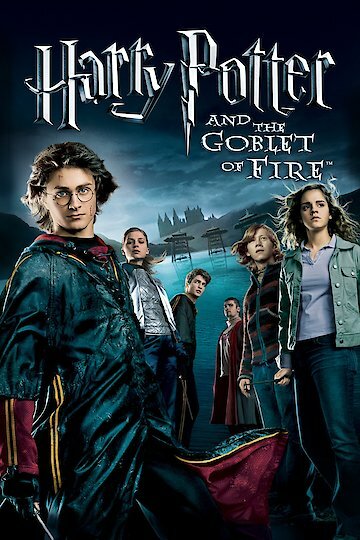 Harry Potter and the Goblet of Fire is currently available to watch and stream, buy on demand at Vudu, FandangoNow, iTunes, YouTube VOD online. 'Harry Potter' Spin-Off Movie 'Fantastic Beasts' Will Be a Trilogy! The three movies have also been scheduled for release dates.